Darlington/Black Hawk senior Kolbe Ubersox became Darlington's all-time leader in wins (152) and pins (73) en rout to winning the 132-pound title at Saturday's SWC/SWAL Clash. POSTED February 7, 2019 1:16 p.m.
RICHLAND CENTER – Darlington/Black Hawk senior Kolbe Ubersox had plenty to celebrate in his final appearance at the SWAL/SWC Clash. Before locking down his second career Clash title, Ubersox became Darlington's all-time leader in wins and pins by breaking the school records held by former Darlington standout Devin Malott when he registered a fall in 2:22 over Mineral Point Bo Hanson in a quarterfinal match at 138-pound. The pin was the 73rd of Ubersox's career and the victory gave him the record-setting 149th and 150th wins of his career following a opening round bye. Ubersox (32–3 overall) posted a 5–3 decision over River Valley's Devan Alt in the semifinal round to make the finals at 138, and then edged Prairie du Chien's Traeton Saint, 7–6, for the title. The Darlington senior won the title at 132 last year. "It was a big eye-opener for Kolbe with his win over Saint, who is ranked second in Division 2. He knew he was going to have his hands full, but he took care of business. The score doesn't show how much he was in control of Saint. I thought he wrestled a smart final match, and he wrestled with confidence all day," said co-head coach Jim Seffrood. The WarBirds placed nine of their 11 wrestlers en route to a seventh-place team finish with 158 points. SWAL dual meet champion Fennimore won their fifth consecutive Clash team title with 285.5 points, while SWC runner-up Prairie du Chien (272) placed second ahead of SWC champion Lancaster (245). Mineral Point (218) and River Valley (206) rounded out the top five at the 13-team event. 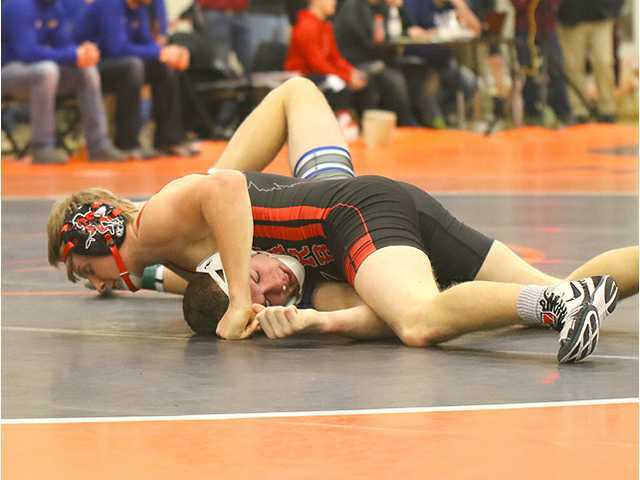 Bontreger (39–1), the top-ranked 106-pounder in Division 3, cruised to the 106-pound title to lead the Flying Arrows to a third-place team finish at Saturday’s 13-team SWC/SWAL Clash conference tournament. Bontreger defeated Fennimore’s Brody Lee 8–3 in the finals. The sophomore point guard scored a game-high 23 points to go along with five steals, three assists and five 3-pointers to lead the #1 ranked Warriors (18–0) to a 70–58 non-conference victory at Madison Edgewood last Saturday. Butler also had 19 points, five rebounds, five assists and five steals in Black Hawk’s 84–20 victory over Juda on Friday night. Edge scored a game-high 19 points on 8 of 14 shooting and grabbed a team-high eight rebounds to lead the Chieftains (13–3, 8–0) to 70–47 win at River Ridge last Friday night. Edge then posted six points and six boards in Potosi’s 55–38 non-conference victory over Southwestern Monday night. Hennessey won the 220-pound title with a by, two lightning-fast pins — 37 seconds and 21 seconds — and an 11–4 victory over Fennimore’s Brayden Leffler in the finals. Hennessey is the top-ranked 220-pounder in Division 3. Kleiner scored a career-high 16 points, including a 4-for-4 effort at the free throw line, and pulled down eight rebounds in Cuba City’s 57–49 victory over Boscobel last Friday night. Monday night, Kleiner topped his career-high when he scored a game-high 17 points and grabbed seven boards in a 64–51 victory over visiting Dodgeville. Lancaster scored eight points in each half on his way to a game-high 16 points in first-place and undefeated Darlington to a key 60–41 victory over visiting Fennimore last Friday night. The second-ranked Redbirds improved to 16–0 overall and 10–0 in the SWAL with the win. The three Fennimore juniors won individual titles at Saturday’s SWC/SWAL Clash to lead the Golden Eagles to a fifth-straight conference title. Lull won the 120-pound title with a pin of Belmont/Platteville freshman John Burbach. Nutter won the 132-pound title with a 9–8 decision over Mineral Point’s Caden Carey. Ahnen won the 170-pound title with a 3–1 victory over Boscobel’s Chase Beinborn. Fennimore (285.5 points) held of challenged from Prairie du Chien (272) and Lancaster (245). Murphy poured in a career-high 31 points on 11 of 14 shooting, including 4 for 4 from 3-point land, and had three steals in Lancaster’s 61–52 victory over Richland Center Friday night. Murphy then scored five points in the Flying Arrows’ (12–6, 4–4 SWC) 58–36 non-conference victory at Benton Monday night.